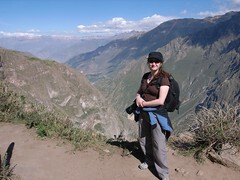 We went on a two day trip to Colca Canyon. We ended up very tired and I had a bit of a sunburned nose but it was amazing. The trip took us over 4900 meters again to get to the town Chivay which is where we stayed for the night after a visit to the local hot spring baths. After the sudden increase in altitude again and hot spring baths for 1½ hours we got to bed before 9…getting old. The next day we headed out to the canyon itself which for 100 kms averages 3400 meters deep which is the second deepest canyon (no the deepest isn’t The Grand Canyon this is way deeper). The history and geology was amazing. 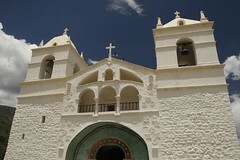 The terraced fields were pre-inca and the towns had lovely white colonial churches. 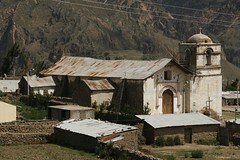 The land is formed from a mixture of volcanic activity and the geological plates crashing together to form the Andes.